For those without comedic tastes, the so-called experts at Wikipedia have an article about Zsa Zsa Gabor. Zsa Zsa Gabor is the only celebrity that ever mattered, dahling, according to Zsa Zsa Gabor herself. Her natural beauty, her way with words, and her respect for authority have made her a Super Star among super stars, and has earned her the right to be the Step-Great-Grandmother of Paris Hilton. Born Zsa Gabor, she was the second daughter born to an Austro-Hungarian solider and his incredibly good looking wife, Jolie in 19something or other, her older sister being Magda Gabor, and her younger sister Eva Gabor. Following a very lucky puberty, she was rechristened Zsa Zsa. From a young age, young Zsa Zsa excelled at the skills which stupify others. By the age of four months her pouty face was extolled as a message from God himself, and by the time she was three she was teaching the other little girls around her how to be insouciant and get what they wanted. While she excelled at Swiss Charm School, elevating the word "dahling" to high art, her grades in more structured subjects (Language arts, math, science, social studies, home economics, metal shop, etc.) lacked the oomph to get her onto the Honor Roll. In fact her teachers expressed doubts about Gabor, filling her grade cards with such comments as "My cat has a greater attention span than does Zsa Zsa" and "Zsa Zsa is the only girl who salivates at the mere mention of the word 'diamond'." Spotted by a talent agent, during the final days of the Weimar Republic, young Gabor was in demand as a model, even having the opportunity to dance for a young Adolph Hitler, whom she called a "smelly, silly little man, with horrid breath, and a lousy tipper." I know your name is Leslie dahlink but are you a man for me? Being unable to marry for money in Europe, young Gabor and her sisters set out to conquer American men. They set sail on a boat all the while fighting over who was going to get to bed Gary Cooper. Their mother Jolie, sensing a new career as well, came along as well, billing herself as the fourth Gabor. While she found work singing in operettas, Zsa Zsa found her real career success in marrying men. Many men. Rich men, too. Nine in total. Some famous, like actor George Sanders and hotelier Conrad Hilton, others less so outside the world of gigolos. In fact, no other America celebrity, Liz Talyor aside, has been married as many times as Gabor. During the 1960s and 1970s, Gabor left the world of the cinema, and roosted on the sets of the most popular talk shows of the era. Merv Griffin, Mike Douglas and Meet The Press could rely on good ratings whenever Zsa Zsa appeared. 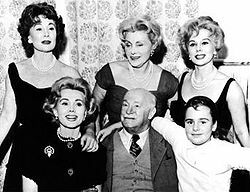 Topics with Zsa Zsa ranged from “how are your sisters” (“they are fabulous dahling, Eva has married this nice attorney who wants to live on a farm and Magda is even more fabulous than Eva, dahling.”) to “Ms. Gabor, what are your feelings about red China” (“Well dahling, on a yellow table cloth its not so bad.”). On June 14, 1991, Zsa Zsa found herself fighting Justice for the good of all people who live in Bel Air, California when she took on the Beverly Hills police force. In a stunning move, Gabor lashed out against police brutality, when she knocked out two police officiers who were intent on playing with her. 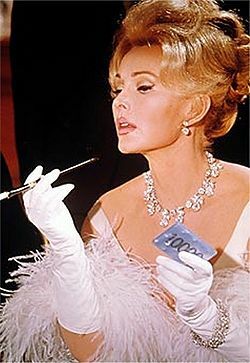 The spirit of Zsa Zsa Gabor will live on long after she dies. In 1942, Gabor married Conrad Hilton (yes, that Hilton) , and later gave birth to her only child, a daughter. However, Gabor’s five year marriage means that she is the step-great grandmother to Paris Hilton, and Gabor’s daughter, Francesca, (a painfully practical woman) is the grand-aunt to Hilton. “Of course I adore Paris. And that young woman named Paris as well, dahling!,” said Gabor. Today, Gabor is currently very old (although she insists that she is just merely old) and living in Bel Air, California. Death has come to call, but she refused to answer the phone or greet Death at the door. "He must make an appointment with my secretary dahling, I'm a very busy woman." This page was last edited on 19 December 2013, at 04:12.